Recorded at Steve Albini’s Electrical Audio studio in Chicago and mixed by Sanford Parker, Helen Money’s second release, In Tune, on the Table of the Elements label, presents eight new original compositions together with a cover of a Minutemen classic. A dark and joyful ride. Recently named Top Ten Chicago Independent Releases for 2009 by The Chicago Tribune: "Alison Chesley took her classically trained cello technique and brought it into the world of independent music in the ‘90s, and we’re all the better for it. Besides her work in Verbow, she’s collaborated with countless artists and written for movies and dance productions. 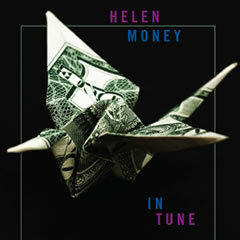 But her solo albums, recorded under the moniker Helen Money, are her defining statements. “In Tune” is anything but obtuse; Chesley expands the vocabulary of the cello to make it sound like a guitar, a drum or a trash compactor. The inventiveness of her instrumentals will prompt not just respect (and awe) from music heads, but head-banging, fist-pumping approval from folks who just want to rock.